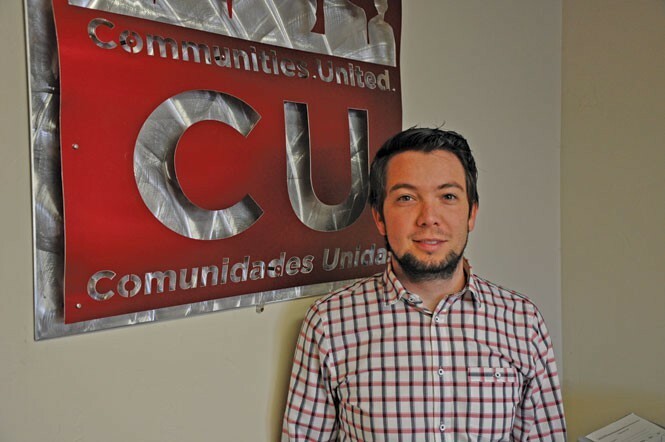 Immigrant rights nonprofit Comunidades Unidas along with Salt Lake County is launching a service to help residents apply for citizenship. The launch will take place on Sept. 17, which happens to be National Citizenship Day. Salt Lake County Mayor Ben McAdams, Salt Lake City Mayor Ralph Becker, state Senators Luz Escamilla, D-Salt Lake City, and Jim Dabakis, D-Salt Lake City, will be among those speaking at the event, to be held at the Glendale Library from 3 p.m. to 4 p.m.
Comunidades Unidas' director Luis Garza (above) said in a text message that the launch would highlight a "citizenship corner" that would be a permanent part of the library as a place where "our staff will go on a regular basis to provide information and connect people with resources to become a citizen." Garza adds that Salt Lake County will be announcing a "citizenship corner" in the 2100 S. State St. building that will provide the same service. National Citizenship Day, which promotes naturalization and recognizes those who have become citizens, is celebrated on Sept. 17, the same day as Constitution Day, held in observance of the 1787 signing of the U.S. Constitution. According to a press release from Comunidades Unidas, the Citizenship Campaign will assist local residents with citizenship applications and help them find resources to navigate the process of becoming a citizen.